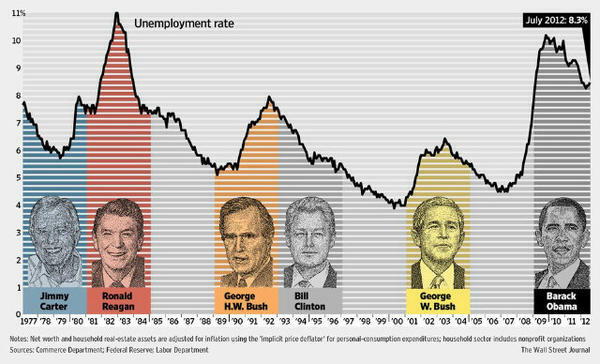 The Wall Street Journal constructed this great overview of the unemployment rate under the last six presidents. After a big increase in the unemployment rate under Reagan, unemployment hit a record high of 11 percent, a structural decline set in. Despite cyclical increases, the unemployment rate decreased to 4-5 percent under Clinton and again under George W. Bush. Will the percentage of people of the job force without a job go to around 5 percent again?